“As I have said, both of my grandfathers were World War II vets. The following is a true story of one my grandfathers and how it came to affect me nearly 50 years later. “My grandfather, who was in the Army, was Captain Garrold Nungester [ 1 ]. He and his Army National Guard unit were called to active duty in 1941. He was already practicing medicine by the time he enlisted. “He was shipped overseas, after basic training, to the African theatre and was among the Americans captured when Rommel overran the American forces at the Kasserine Pass. 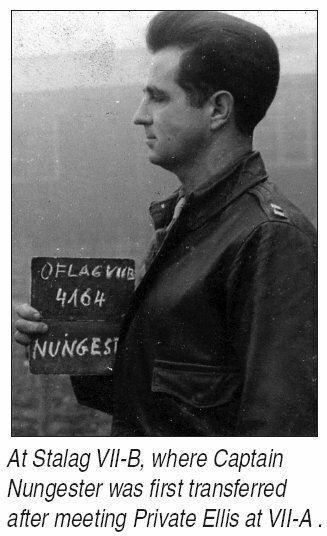 “He was initially shipped to Stalag VII-A, where he came in contact with Private Donald B. (Don) Ellis [ 2 ]. Stalag VII-A was a central processing camp, where the Germans separated prisoners (Jewish, Americans, Russians, British, Poles, etc). “Once they were classified, many were shipped to other camps. At this particular camp, my grandfather was one of several doctors. He treated fellow prisoners, Americans, British. It didn’t matter; they were allies. “Private Ellis was wounded in the leg as he floated down and was captured soon after. He was taken to Stalag VII-A, where my grandfather was. “By the time my grandfather saw him, Private Ellis’s leg was badly infected. One thing in very short supply in prison camps were drugs, especially sulfur drugs used to treat wounds. “Private Ellis was nearly delirious from his wound. Most of the other doctors wanted to amputate Private Ellis’s leg, but my grandfather insisted on trying to save it. “To compound matters, Private Ellis had a staph infection. The wounded who had staph infections were like pariahs in camp because other soldiers feared contracting it. It was almost like a death sentence. “My grandfather stayed with Private Ellis for about a week and half, changing his bandages every day, at risk to his own health. He not only saved Private Ellis’s leg but his life as well. Shortly thereafter, my grandfather asked to be transferred to another Stalag that was short of medical doctors, as there were plenty at VII-A. “As luck would have it, my grandfather, after a brief stay at VII-B, wound up in the infamous Stalag XVII-B, made famous by the movie, ‘The Great Escape,’ with Steve McQueen. and to a lesser extent, the TV show , ‘Hogan’s Heroes.’ (My grandfather loved that show, and I would watch it with him when I was a kid, although he assured me that XVII-B was ‘nothing like Hogan’s Heroes.’) It was at this point that Private Ellis and my grandfather lost touch. “Now, fast foward about 50 years. My grandfather passed away in 1996. We still own his river place (my little slice of Heaven -- spent many a day on the river fishing with my grandfather). “One day, about six years ago on a trip down to the river place to cut grass and drown a few crickets, I found a letter stuck in the door to our cabin. It was from a ‘Mr. Ellis,’ who said he was looking for a ‘Dr. Nungester.’ “He explained that he and his wife, both retired, were traveling through Alabama on their way to a guest preaching assignment in South Alabama. “The letter further explained, at least partially, that he had been in a Prisoner of War camp with a Captain Nungester and wondered if this might be the one. “He said he was a retired Methodist minister from Indiana and was trying to find this Captain Nungester or his family. He included a phone number and an address where we could reach him. I would later learn that he had enlisted the help of another former POW friend, who was an FBI agent, to track down my grandfather. 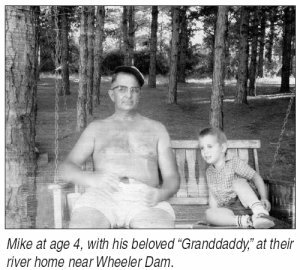 “The only information he had to go on was that my grandfather was originally from Decatur, Ala. After much perseverance, Mr. Ellis found the number and address from my grandfather’s cabin, which was still listed in his name. I read the letter and put it in the car, and when I returned home, I took it to my mother, who said she would attempt to contact Mr. Ellis. “After about a month, she made contact with him. Mr. Ellis said that he and his wife would like to meet with us both on their return trip to Indiana. We agreed to meet. “We met Mr. Ellis and his wife at a restaurant in town (in Huntsville, Ala.). We came armed with old photos of my grandfather from his military days as well as newer photos. When we met them, we explained to Mr. Ellis that my grandfather had died the year before, which saddened him. “Mr. Ellis told us the story of my grandfather treating him at Stalag VIIA, and we exchanged photos and stories about my grandfather. It was very moving meeting to say the least. “After about an hour or so, they had to head on their way, but before leaving, Mr. Ellis asked us if we had seen the movie, ‘Saving Private Ryan’. “We said we had not, but we both intended to (it was in the theaters at that time). He asked us to call him after we had seen it and told us that there was a scene at the beginning of the movie that he particularly wanted us to see. “A week or so later, we saw the movie, and as promised, we called Mr. Ellis. He asked about the opening scene, where Private Ryan is an old man and visits the grave of the sergeant (Tom Hanks’ character) who had saved his life. “Neither my mom nor I had a dry eye. 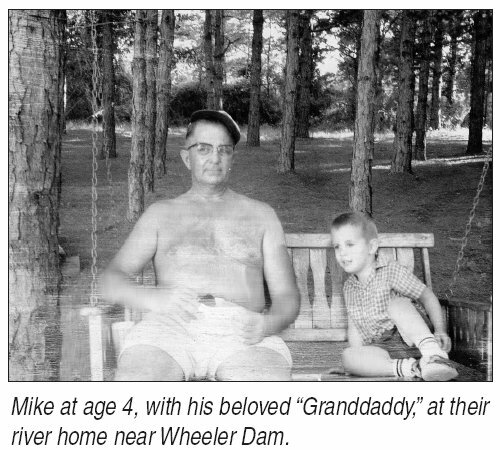 We had always been proud of my grandfather, but that was especially touching. “We have kept in touch with Mr. Ellis, who is still living, and just last year about this time, we took him to visit my grandfather’s grave. “He was very moved and emotional at the gravesite and said a prayer, then saluted my grandfather. The pride I felt and the lump in my throat at that moment overwhelmed me. “The number of people that my grandfather touched and the difference he made in so many lives were amazing. “This generation, this ‘Greatest Generation’ was made up of men of similar character. I salute you, Mr. Ellis ... and the soldiers who never made it back to their families ... those who did and made this country great ... and also those of the next generation who are risking their lives in Iraq and Afghanistan to continue the legacy. Note 1: Dr. Nungester is not only the grandfather of Mike Bentley and his brother, Greg, a former TBE employee; he is also father of Janet Bentley and great- grandfather of Jane Kathryn Bentley. What’s more . . . Dr. Nungester was a popular, local family physician in the days when delivering babies was not the sole purview of obstetricians. During his 50+ years of practicing medicine, he delivered not only Mike (April 1958) but TBE’s own Ed Breland (see Ed for date)! Note 2: Don Ellis will be 86 years old on Aug. 1, 2005. Anyone who would like to send him a birthday card or card of thanks can contact Mike Bentley, 961- 2165, for his address. From a Troop Supporter Leader: Your story belongs to everyone, especially the Friday before Memorial Day. Please send it to the Troop Supporters. We just finished a “box party” when I got your email, and I’m glad I was alone when I read your letter. From a naturalized American citizen: Thanks for this touching story. I couldn’t control myself; my eyes were wet, too. This is one more reason why I always honor the requests from disabled veterans organizations. Last update 7 Nov 2006 by © Team Moosburg Online - All rights reserved!